Video clips and pictures are available in the Gallery. Residue premiered on October 5, 2017, at The Boiler in Brooklyn, NY. Residue is supported by New Music USA, made possible by annual program support and/or endowment gifts from Mary Flagler Cary Charitable Trust, New York State Council on the Arts, New York City Department of Cultural Affairs, Howard Gilman Foundation, Helen F. Whitaker Fund, Aaron Copland Fund for Music, Carl Jacobs Foundation, and the New York State Council on the Arts. Nonetheless premiered on September 19, 2015, at Triskelion Arts in Brooklyn, NY. Wisp premiered on September 19, 2015, at Triskelion Arts in Brooklyn, NY. A Delicate Madness premiered on November 6, 2014, at Triskelion Arts in Brooklyn, NY. Support for the creation of this work provided by a Mertz Gilmore Late Stage Production Stipend, the Triskelion Arts’ Space Subsidy Program made possible with support from The Andrew W. Mellon Foundation, and fiscal sponsorship through The Field. FOILed again premiered on October 24, 2013, at Triskelion Arts in Brooklyn, NY. Click here for the exam answers. #64 premiered on September 25, 2013, at The Green Building in Brooklyn, NY. A strange set of attachments premiered on November 9 - 11, 2012, at Triskelion Arts in Brooklyn, NY. Performed by Erica Moshman, Jessi Patz, Becky Radway, and Heather N. Seagraves and over 125 special guests! This event was sponsored, in part, by the Greater New York Arts Development Fund of the New York City Department of Cultural Affairs, administered by the Brooklyn Arts Council, Inc. (BAC), as well as Triskelion Arts' Space Subsidy Program made possible with support from The Andrew W. Mellon Foundation. Palisade premiered on June 24-26, 2011, at Triskelion Arts in Brooklyn, NY. Created to rein in the company with audience on opposing sides and a movable fence structure, Palisade delves into the intimate encounters created by this enclosure through tactile investigation and animalistic exploration. Palisade was created in part through The Field's Emerging Artist Residency program, supported by Lambent Foundation Fund of the Tides Foundation, as well as support from the Northern Manhattan Arts Alliance Regrant Program, made possible by the JPMorgan Chase Foundation and the Upper Manhattan Empowerment Zone Development Corporation. Winter premiered on December 3, 2010, at Jimmy's No. 43.
crowd or company premiered on April 24, 2010, at Green Space. Performed by Jodi Bender, Maria Colaco, Nicole Durfee, Meredith Fages, Liz Gorgas, Ayelet Haran, Laura Henry, Kathryn Holmes, Lindsey Kelley, Alden LaPaglia, Meghan McCoy, Alexis Silver, Meryl Thurston, and Diane Tomasi. Original Score by Scott Radway. crowd or company is made possible in part by a Harkness Space Grant from the 92nd Street Y Harkness Dance Center and support from the Northern Manhattan Arts Alliance, the JP Morgan Chase Foundation, and the Upper Manhattan Empowerment Zone (UMEZ). slow parade was originally created and rehearsed in only 1 hour -- the only requirement was to make something about "love". They did not say it had to be "nice". slow parade premiered on February 12, 2010, at Jimmy's No. 43. Performed by Carlton Ward and Becky Radway. And They Built a Crooked House is an original dance-theater work choreographed by artistic director Becky Radway. It is a story of four wanderers living in a dim corner of the world. By looking after one another, they grow into a touching, yet somewhat off-kilter family. We follow them down dark alleys, glimpsing hidden moments and kept secrets. While they have each lost a part of themselves along the way, they survive for each other. And They Built a Crooked House is made possible in part with public funds from the Manhattan Community Arts Fund, supported by the New York City Department of Cultural Affairs and administered by the Lower Manhattan Cultural Council. Roam is a glimpse at five wanderers. 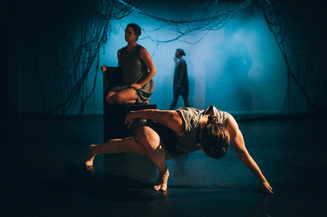 In a collection of six movements, the audience follows these travelers as they explore one another as well as the environment surrounding them. At times tender and intimate, at others sharp and aggressive, the dancers learn to trust each other and enjoy their company along the way. Roam premiered on February 6, 2009, at the Merce Cunningham Studio. Performed by Leonides Arpon, Maureen Damaso, Jessi Patz, Becky Radway, and Meryl Thurston. A site-specific work for four dancers, created for the Outlet Dance Project at the Grounds for Sculpture in Hamilton, NJ. Inspired by the hill near Magdalena Abakanowicz's Hand-Like Tree: Cecyna. High Ground premiered on October 5, 2008. Performed by Meghan McCoy, Nicole Durfee, Laura Henry, and Becky Radway. Original music by Scott Radway. 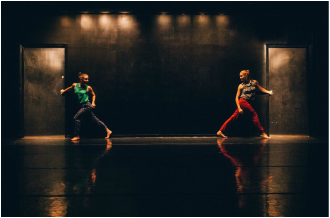 Postcards is a duet designed to unravel a bittersweet romance through lofty partnering and playful interactions between the dancers. The story is told in reverse, culminating in the innocent first meeting of the two characters. An original music score accompanies the dance, written by Philadelphia composer Scott Radway. The choreography itself melds pedestrian gesture with complex partnering to portray this tender relationship. Postcards premiered in April 2007 at Triskelion Arts in Williamsburg, Brooklyn. Build/Run/Speak is an ensemble piece in three sections, based around the creation of a working machine. It begins by collecting each necessary part, arranging and moving through its regular functions, and ends with the final creative output. Build/Run/Speak premiered in December 2007 at Triskelion Arts in Williamsburg, Brooklyn. Performed by Nicole Durfee, Meredith Fages, Laura Henry, Kathryn Holmes, Alden LaPaglia, and Amanda Wentworth. #19 is a quirky duet performed entirely in unison. While the piece is based around the intricate gesture and quick directional changes, it is reminiscent of our youthful days of self-consciousness and general mayhem. #19 premiered in September 2007 at the Merce Cunningham Studio. Performed by Meredith Fages and Becky Radway. Tomorrow is a dark duet, based on the close relationship we create while pushing through a difficult time together. The title reflects the idea that if we can simply make it to tomorrow, everything will work itself out. The dancers are taking care of one another but also trying to come to terms with their own insecurities. Tomorrow premiered in December 2003 at One Arm Red in Brooklyn, NY. Performed by Danica Kalemdaroglu and Becky Radway. My Eyes Are Closed, But I'm Not Sleeping is an investigation into how deeply we rely on the people around us to keep us settled in our own lives. Do we really need those influences to be satisfied and comfortable as individuals? Are we desperately trying to ask someone for help? This group work explores the desire to be self-sufficient and strong, letting go of the things we rely on, but continuing to travel along a shared path in our own way. My Eyes... premiered in April 2006 at Triskelion Arts in Williamsburg, Brooklyn. Performed by Liza Domnitz, Meghan McCoy, Kate Martel, Alden LaPaglia, and Amy Rance. Thread is a movement study with socks. Without a direct story line, it focuses on increasingly frantic movement due to the slippery surface and fast-paced choreography. Thread premiered in February 2005 at Alvin Ailey's Citigroup Theater. Remember This Place opens with the image of a single dancer alone in an expansive space. Throughout the dance, she searched blindly for something, anything at all, that can guide her to security. Remember This Place premiered in March 2006 at The Stable in Williamsburg, Brooklyn.